It's a longliner plying the turbulent water of the Gulf of Alaska and a seiner chasing salmon in Alaska's Inside Passage. It's an oil platform in Cook Inlet and a remote logging site on Prince of Wales Island. A gold mine near Juneau and a power plant in Ketchikan. A Coast Guard cutter in Kodiak and a commercial helicopter in Kenai. A service station in Whitehorse, a tour bus in Homer. At Petro Marine Services, we pride ourselves on serving the unique petroleum needs of a broad range of Alaskan industries, including: fishing, home fuel sales, power generation, petroleum, tourism, timber, construction, mining, and retail gasoline. And we do it in some of the harshest and most challenging environments on earth. 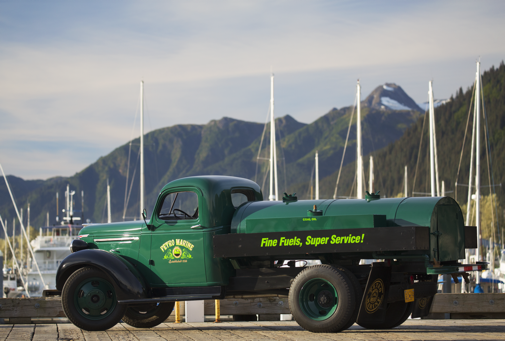 By living by our motto – "Fine Fuels, Super Service, Quality Lubricants" – we've grown to become Alaska's largest independent petroleum marketing and distribution company, serving customers throughout Southeast and Southcentral Alaska, as well as the Yukon Territory.